Manage your Microsoft Exchange recipients delegate control, including the "Deliver meeting requests" setting, outlook folder permissions and all Free/Busy options with your Active Directory Users and Computers. Utilizing the Exchange Web Services (EWS) interface introduced in Microsoft Exchange Server 2007 SP1 and above, you can give yourself and the helpdesk department the ability to control these options easily. ...... Secretaries, managers and other business operations require custom permissions on mailbox folders: Inbox, Tasks, Notes and the Calendar including Free/Busy information and controlling meeting requests sending options. 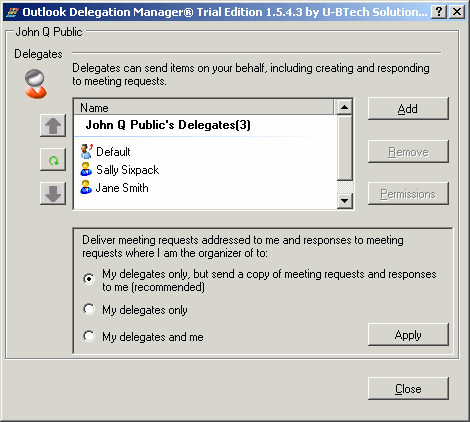 Qweas is providing links to Outlook Delegation Manager 1.5.8.3 as a courtesy, and makes no representations regarding Outlook Delegation Manager or any other applications or any information related thereto. Any questions, complaints or claims regarding this application Outlook Delegation Manager 1.5.8.3 must be directed to the appropriate software vendor. You may click the publisher link of Outlook Delegation Manager on the top of this page to get more details about the vendor.